Point Park University psychology students and faculty presented their research work March 26 - 29 at the Eighth Annual Conference of the Society for Humanistic Psychology (led by Division 32 of the American Psychological Association) at the Chicago School of Professional Psychology. Psychology professors Robert McInerney, Ph.D., Brent Dean Robbins, Ph.D., and Matthew Allen, Ph.D., accompanied the students on the trip. The student trip was arranged by the Confluence Psychology Alliance student group and supported by United Student Government, the Department of Humanities and Human Sciences and James Thomas, Ed.D., associate vice president for Academic and Student Affairs. 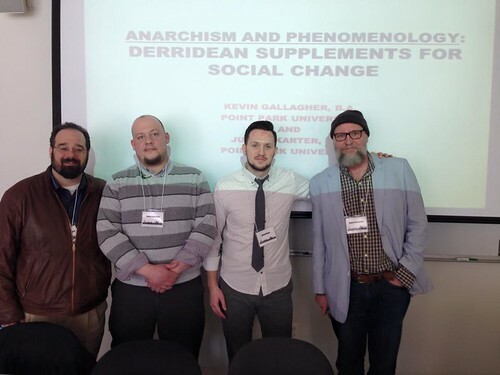 "The conference was not only academically enriching, but also awe-inspiring. The opportunity to network and participate in presentations with leaders in the field of humanistic psychology further clarified why this is the route I chose for my life," remarked Nicolas Scott Moran, a senior psychology major. "This trip would not have been possible without the support of Dr. Robert McInerney." "When you are part of such a diverse group, who are all, in their own ways, working toward the same ends, it's transformative. It was enlightening to be a part of such a caring, thoughtful, open and energetic community," said M.A. in clinical-community psychology student Kevin Gallagher. The focus of this year's conference was "Humanistic [R]evolution: Innovative Relevance in a Complex World." "Our programs take a humanistic approach to psychology, so this was a great opportunity for our students to interact and learn from some of the best minds in the field. However, most thrilling for me was hearing such universal acclaim for our students from my colleagues, who were very impressed with the outstanding work our students are doing. They made us very proud," said Robbins. "The students networked and met graduate faculty from other universities as well as some of the scholars they were reading about and referencing in their own research," added McInerney. "The constructive feedback each of us received during our poster sessions brought new joy and excitement to the research we've been engaged in," explained Moran.